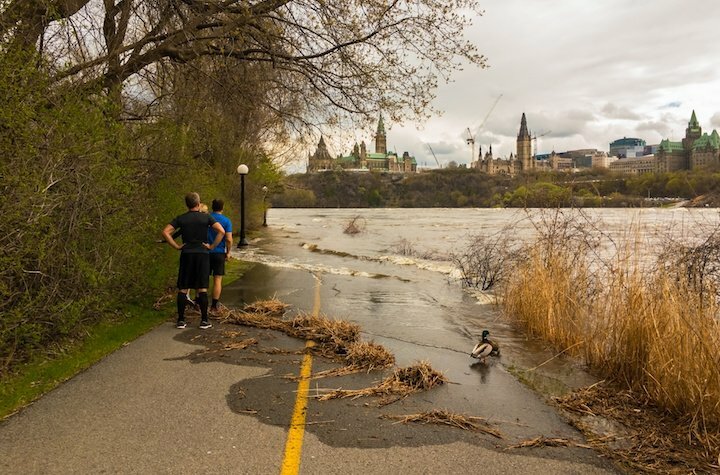 The entire Ottawa area has been hit hard by this week's intense levels of rainfall, but nowhere has felt the brunt of it harder than North Gower, a small township located southwest of the nation's capital whose population hovers near 2,200 and has never before experienced this kind of a downpour. "I'd never seen anything like this since I've lived here," said North Gower resident Ron Doyle, to CBC. "I hope the water hasn't done too much damage in my basement. But I'm pumping it out right now as fast as I can. I hope my insurance covers it, I guess." The severity of this individual flood is compounded by what has already been an unusually rough warm season for the township. "[The rain] has really just added to a bad situation to begin with" said regional councillor Scott Moffatt. "This is about the third or fourth flood event that we've seen in the North Gower area this spring and summer. It's been a very difficult summer for at least the farmers around here, but now all of a sudden what we're seeing here is impact on homes, impact on local businesses, because the level of the water is just so high." It has unfortunately also led to issues with natural gas, hydro, drinking water, and rotting lumber, the latter of which has been harmed by the need to lock several of the Rideau Canal lock stations. Some of those, however, have now reopened. Those are the Brass Point Swing Bridge, Poonamalie, and Beveridges lock stations. Parks Canada has been working diligently to have Canal activity return to normal and will be providing regular updates on the status of operations.